Chinese cinema has been hailed for many things. For the focus on realism, the great visuals, the pointy comment on the regime, and many other aspects. However, what Chinese films seem to lack in their vast majority, is a sense of humor, which will lighten the drama that usually permeates the productions of the country. "Free and Easy" comes to cover this particular gap, without stripping the medium from the rest of the values of the country's cinema. . The story takes place in a desolate factory town, in a setting that could be easily described as dystopian, although the concept is not futuristic at all. In this strange town, the roads of a number of unlikely individuals meet. A soap salesman pitches his products, although his agenda is not so innocent. A Buddhist monk tries to spread the faith, for a price. A failed martial arts instructor becomes the victim a number of times, including when he is trying to file a report to the two bored and not very smart policemen that comprise the local police department. A young man preaches Christianity while he posts flyers for his mother who is missing. A ranger who is in charge with the area's reforestation is enraged because someone is stealing the trees. Furthermore, one of the policemen seems to have some ideas regarding a woman in the area, an old lady accompanied by two thugs appear, a murder occurs and unlikely friendships and relationships are built. Geng Jun has an approach that manages to present social critique through a unique combination of intelligent, subtle and slapstick humor, mainly deriving from the characters and the way their relationships are formed. Each of the characters seems to represent an archetype of the current Chinese society, particularly regarding the faults of each one. 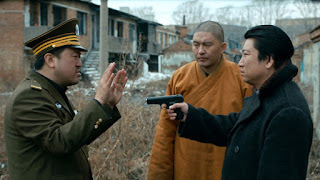 In that fashion, the Buddhist monk uses religion to get money, the policemen are bored, incompetent and dangerous, the ranger-bureaucrat over his depth, the Christian swamped in his effort for morality and lost hopes, and the martial artist a failure in all aspects. All of the above are presented in an original combination of intelligent, subtle and slapstick humor, although probably the funniest thing of all is how most of them come together eventually, despite their obvious, and quite radical differences. Wang Qeihua's cinematography is another of the film's traits, with him making great use of both the desolate and rundown environment of the destroyed city, and the openness of the fields that surround the area. One of the highlights of his work is presented in the final scene, in very different fashion than the rest of the film, including the sounds of a very interesting rock theme from the Second Hand Rose band, and some visual effects. Apart from the above, the film moves in the slow pace of most of the Chinese art-house scene, although Guo Xiaodong and Zhong Yijuan's smart editing induces the film with a sense of constant movement, which prevent the movie from becoming tiredly still. The acting follows the general strange ways of the film, with the whole cast presenting characters that linger between small-time crooks and complete idiots. I enjoyed very much a recurring tactic in the film, when one character does or says something completely idiotic or out of place, while the one who interacts with him stays stupefied with a perplexed look on his face. Zhang Zhiyong as the traveling salesman, Xu Gang as the monk and Gu Benbin as the Christian are the ones who stand out. although none of the performances is even remotely lacking. "Free and Easy" is , which seems to produce many films that look much alike. At the same time, it offers a hilarious (although not of the "laughing out loud" kind) and very artistic view of the contemporary Chinese society.